James Dietz Hand Signed and Numbered Limited Edition Print:"Mountain Warriors"
Size: Image Size: 25" x 12.625" / Overall Size: 31" x 19.125"
About the Art: In its third and final trip to Afghanistan as the 4th Infantry Brigade Combat Team, "Mountain Warriors" were charged with defeating a committed enemy and transitioning control of southern Afghanistan to the Government of Afghanistan and its National Security Forces. 4IBCT replaced multiple brigades arrayed throughout Zabul and Kandahar Provinces. The reduction in US troops did not bring a comparable reduction in positive effects due to the heroic actions of the Brigade's units and the extraordinary efforts of its Security Force Advisory and Assistance Teams. Both partnered with dedicated and driven Afghan National Security Forces to ensure Regional Command South was secure, stable and sustainable as the entire coalition prepared for the post- 2014 phase of the strategic relationship. During their nine month deployment, the brigade closed or transferred seven major outlying forward operating bases while in continuous contact with the Taliban. The base featured in the print, Masum Ghar, was located in an area of the Arghandab River Valley once controlled by the Taliban. As a result of the pressure both Afghan National Security Forces and ISAF Soldiers put on the enemy, upon the base's transfer the area was firmly in the hands of the Afghan people. This result was mirrored by each of the Mountain Warrior battalions spread throughout Regional Command South. 1-12 IN serving in Dand and Daman Districts protected Kandahar Airfield. 2-12 IN conducted partnered operations throughout all of Zabul Province. 3-61 CAV fought tirelessly across the western districts of Kandahar Province. 4th STB secured southern Kandahar as they operated from Spin Boldak. 2-77 FA provided security within Kandahar City, the regions center of gravity and the BSB operated throughout the battle space conducting route clearance, logistics patrols and retrograde missions. 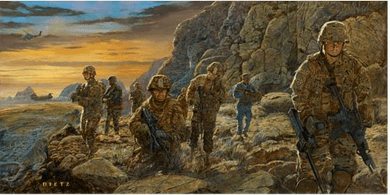 No matter what the battalion, the Mountain Warriors achieved unparalleled success in the final chapter of America's longest war.